Adding appeal to your home is as easy as adding sliding glass doors. It’s something that never goes out of style with its timeless elegance. These doors are used everywhere from homes in the tropics with indoor/outdoor living from the living space to the pool to much further north where beaches aren’t everywhere but beautiful weather does make outdoor living enjoyable. Sliding glass doors are a perfect choice if you want to add some natural light and beauty to your home. If you are on the fence about whether or not to enjoy the many benefits of sliding glass doors in your home, let us help you make the decision much easier. Sliding glass doors are a perfect addition to any home for a variety of reason. One of the most obvious advantages to having a sliding glass door at home is the door’s natural ability to make indoor and outdoor living more seamless. When the weather is nice, you can open the doors and allow the beautiful weather inside while the screen door is closed to keep pets and kids indoors, or kids and pets outdoors while they play. Sliding doors are made better than ever, too. They’re designed with durability, strength and the elements in mind. Not only are they built to make your house look good, but they are also built to keep you safe and to keep your energy bill as low as possible by keeping your house insulated when it needs it most. If you are ready to take the next step in adding appeal to your living space, you might consider sliding glass doors as the next step in home décor. Call us today at (607) 798-9954 or fill out the form online to schedule a complimentary consultation with our sliding glass door experts. We can help you determine which doors best fit your style and needs, as well as answer any questions you might have about the doors and how they might benefit your home. Our experts are always available, and have plenty experience installing sliding glass doors in homes of all shapes, sizes and ages. 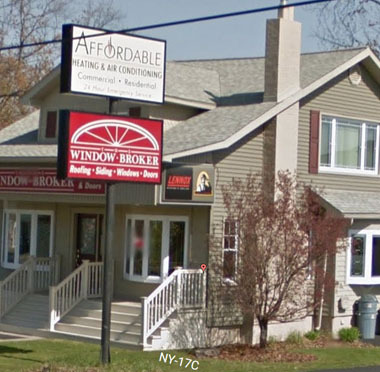 For over 30 years The Window Broker has installed windows, doors, siding, decking, roofing and more for residents in the Greater Binghamton area. Copyright © The Window Broker 2019. All rights reserved.